The FBI has produced a public service “short film” of 28 minutes called “Game of Pawns” (directed by Glenn Feliu) although maybe it could have been titled “A Pawn Sacrifice”. I guess the young man Glen Shriver (Joshua Murray), certainly tall and charismatic enough, thinks that the Chinese got a “lead in development” for their sacrifice of him. He goes to college in Shanghai, loves it, and meets a young woman (oh, how heterosexual) who puts him in touch with Chinese business men (he thinks) who give him the stipend he needs to live there and extend his visa – if only he’ll write some academic papers on American-Chinese relations. Things keep getting more complicated, as he fails a State Department employment exam, but the Chinese amazingly talk him into applying for a job with the CIA, with the purpose of making him a double agent. He flies back to Virginia, sees his family, and then reports to Langley, and fails the polygraph miserably. He quits the application process, but is told he isn’t out of trouble. He tries to fly back to China and is arrested on the plane, and gets a four year sentence for conspiring to commit espionage against the United States. My own novel in development (“Angel’s Brothers”), the CIA agent character went over from Army service in military intelligence, with a cover as a history teacher. There’s not very much overlap to my own scenarios. The virus lives in the jungle, silently, and every few years breaks out when people hunt animals, especially primates (who may get it from bats), and bring them into villages. The disease is spread by direct contact with blood and body fluids and cause the body to lose the ability to clot blood, leading to “bleed outs” and liquefication of tissues. 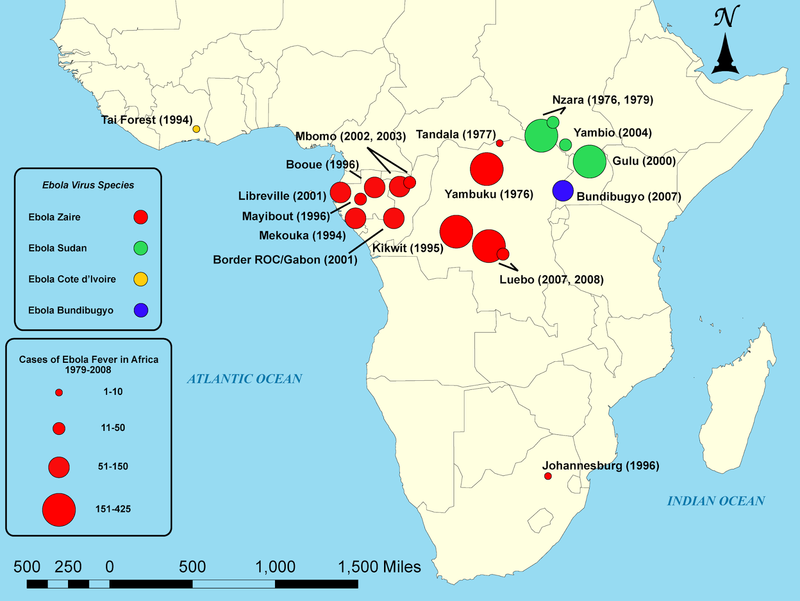 Wikipedia attribution link showing distribution of Ebola, here. Vox reports that victims of Ebola in Africa are often shunned even after they recover, link.